Caroline Park House, originally known as Royston House, was built around 1585 by Andrew Logan. 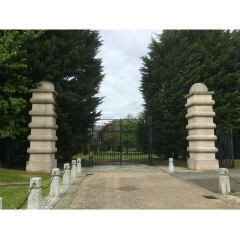 In 1683 it was bought by Sir George Mackenzie of Tarbat, and in 1739 it was sold to the 2nd Duke of Argyll who renamed it Caroline Park after his daughter who married the Earl of Dalkeith. Through this marriage the house and estate passed in 1793 to the Duke of Buccleuch, a pivotal event in Granton’s history. The house was altered in 1740s by the architect William Adam, father of Robert and John Adam. 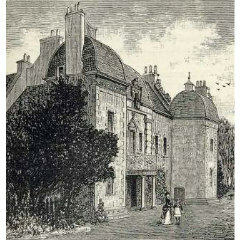 Subsequent tenants of the house have included Archibald Cockburn (father of Lord Cockburn, the conservationist who lamented the development of Granton Harbour) and Lady John Scott (1810-1900), who produced the standard version of the old Scottish song ‘Annie Laurie’. The house (and adjacent Granton Castle), increasingly disturbed by industrial activity, became less attractive as a formal residency. The Duke initially leased the house as an office to AB Fleming & Co Ltd. which owned the printing ink and chemical works located further west of the house. In 1872 the company bought the house and it remained their HQ until 1966 when the company moved to Corstorphine. Since 1988 the house is in private hands.